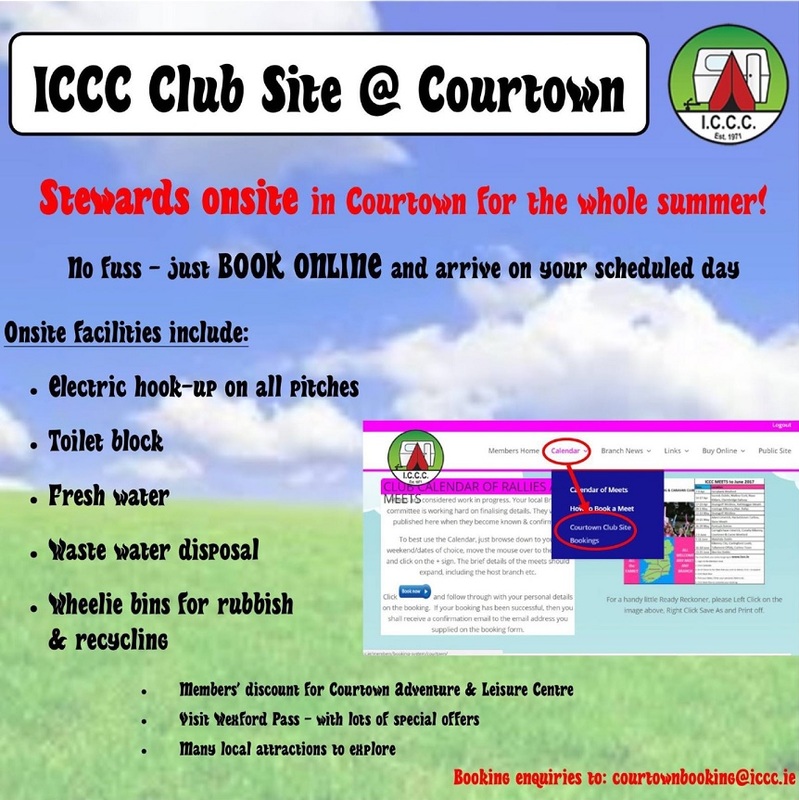 In 2012, the ICCC have recently acquired a second Club site at Harbour Court Road, Courtown, Co. Wexford. The site was officially opened on 27th May 2017. This is an ICCC Members Only site. ICCC Site is located in the town of Courtown, Co. Wexford and is approximately located 90 minutes south of Dublin. It is situated in the sunny southeast of Ireland which has Ireland’s lowest annual rainfall and is a popular holiday destination for families. It is a beautiful harbor resort with miles of golden sandy beaches safe swimming and a choice of attractions & activities. The town itself has a number of different pubs and restaurants as well as a local shops and service station. Courtown North Beach-The ICCC site overlooks this beach which has been a firm favorite with tourists since the turn of the century, and today is still a favorite for families, walkers, water sports and the sun seekers. The beach has a borough along side it which contains spots ideal for picnics and lovely woodlands for walking. The beach also has a lifeguard station. Courtown South Beach – A much smaller beach than the north beach, it also benefits from the village amenities. If you want to get away to a quiet spot – This is where to go. Not suitable for swimming! For all your other needs there is Gorey town which is just a short 10 minute drive away. There you will find a 24 hour Tesco a number of different restaurants and pubs as well as 3 nightclubs. Gorey also has a large number clothes shops and boutiques for all your shopping needs. There are fabulous facilities adjacent within walking distance to include the infamous Pirates Cove Adventure Centre, Swimming Pool and Leisure Centre, Seal Sanctuary etc.